Jolt wrote: Hey TheNewTeddy, welcome to the forum! I still have the map here. Since then, me and Fornadan worked on the zoomed maps, which while not as all-encompassing, were a bit less cluttered and more informative. Regardless, since working on the zoomed maps, I noticed that I missed naming a few settlements here and there, and that still needs correcting. Eventually I got busy with other things in my life and by and large stopped working on it. Fornadan has done quite a bit with the zoomed maps, including putting the commandery and province borders alongside names of settlements which only became reknowed in the Three Kingdoms era, rather than the Late Han. If you're asking about the commercialization/publication of it, we just never got around to it. It's obvious that the Atlas is quite a nice piece of work. I never went through the hoops needed to test print it, see what problems derive from being in physical form, find a company to produce the maps at a competitive cost, and then see the costs of bulk purchasing vs retail selling. As for plain publicizing it, me and Fornadan never got to discussing that either. I know that Fornadan had a website where he planned to release the zoomed in maps, but then I dropped the ball, so I don't know how that progressed. Ultimately, both of us did and do this as a side-hobby, so it was natural that some things just got stuck in limbo. I'm still of the opinion in trying to comercialize the main Atlas (after completing what is missing) and publicizing the zoomed maps, but all this requires that (at least for the maps where we both had a contribution, and every single map I worked on was based on his previous QGIS work) we both figuratively sit down and decide on what to do. For the maps that Fornadan did that had little contribution of mine besides the original translations, I of course defer entirely to him the decision on what to do with the maps. From my part, right now I don't have the availability of going through the mentioned hoops to see if the main Atlas is minimally print-worthy, but I expect that in the coming months, I may be able to sort that out. Personally I'd adore a hard copy to add to my growing 3K library! The problem with Koei games' naming of cities is that they don't follow a coherent process. Some cities bear the name of the commandery rather than of the city itself (Changsha instead of Linxiang), some cities do the opposite (Nanpi instead of Bohai, Ye instead of Wei). Some cities were only named as they are shown in the games much later than the usual starting dates (Sun Quan changing Moling's name to Jianye). Thank you!! This is perfect. I know how much time this stuff can take, and want to thank you for your work on these and other maps. If you ever need a map in this sort of style that would be useful for RTK stuff and have the base materials but not the time to make it, send me a PM here, or on other social media websites (I use the same username everywhere) and I will gladly help. I will try to fix them today. Here you go, based on the Romance and not on history. I took some creative license in some parts, so it isn't the map won't be 100% accurate though. Hey, i think i am now the second person to make an account to talk to you. Respect, you are pretty much the number one authority when googling for maps of the period. How close to the historically accurate division of power are these maps (specifically the one of 210)? 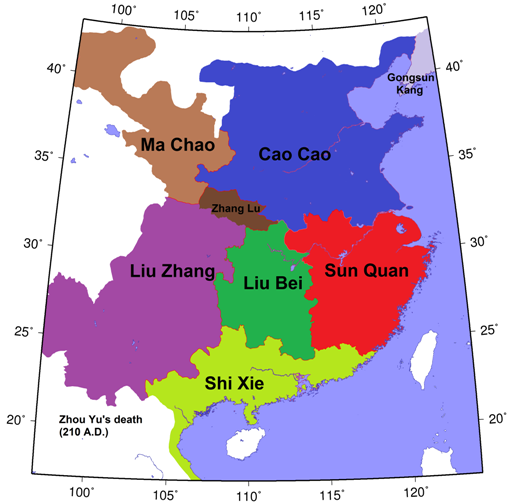 Large part of Bing province was lost/abandoned during the final decades of Eastern Han and Cao Cao probably only controlled the eastern commanderies of the old Han province. Rafe's maps had the Gongsun border at the middle of Liaoxi Commandery, where it's skinniest. On the 190 maplewinernst quoted, it would split Gongsun Zan into two near-equal parts. 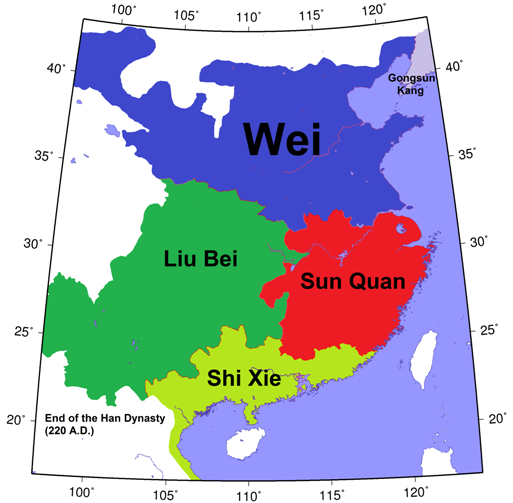 Also, because Wu had control of the Yangtze river all the way up until 276 (when Jin built enough ships to invade Wu -- and even then they were delayed by a XIanbei rebellion in the northwest), Wu had a strip of land (varying in width) north of the Yangtze. 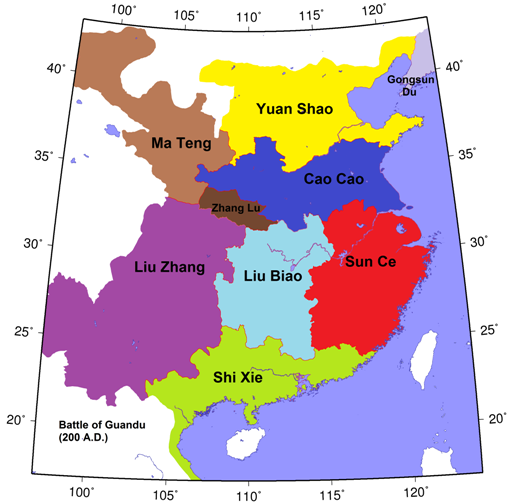 If you look at the maps, you'll see that in northwestern Wei (roughly 107-109 east and 37-40 north) there's an area of non-chinese land almost completely surrounded by Wei land, with a narrow finger at the south; the width of that finger is roughly the minimum that Wu control extended past the Yangtze. Very good to know, thanks a lot . Do any of you know of "plain" maps of the time, meaning they contain geographical features and cities/counties, but no borders or coloration? What software and which raw data do people here use to make these maps (I assume it's not just Illustrator)? There were several changes to the major rivers over time, some more than others. 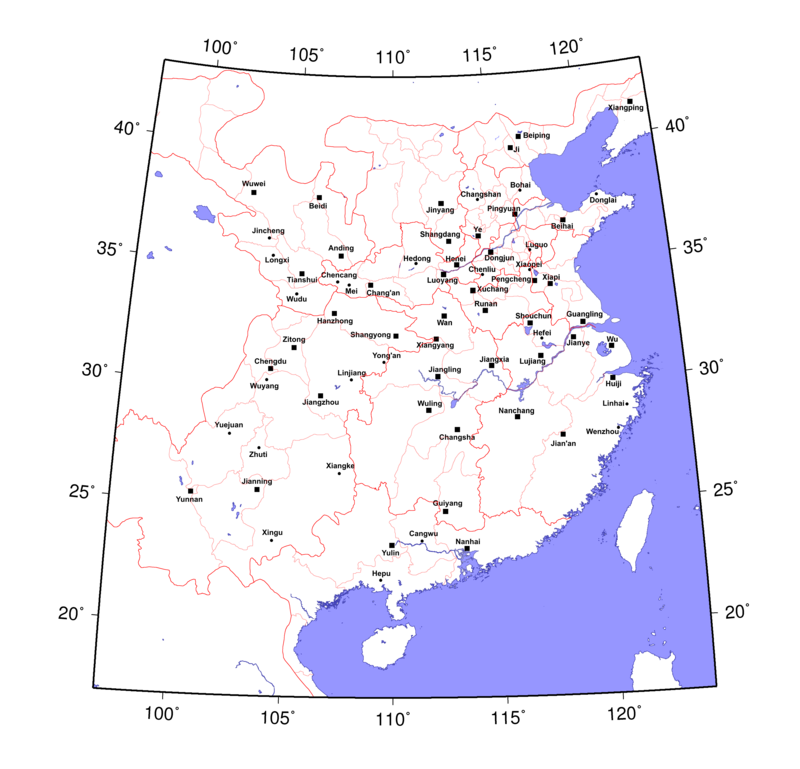 Due to the chinese plain, the yellow river fluctuated wildly, sometimes north of the SHandong peninsula (easternmost Yuan Shao in the 200 map), and sometimes south of it. 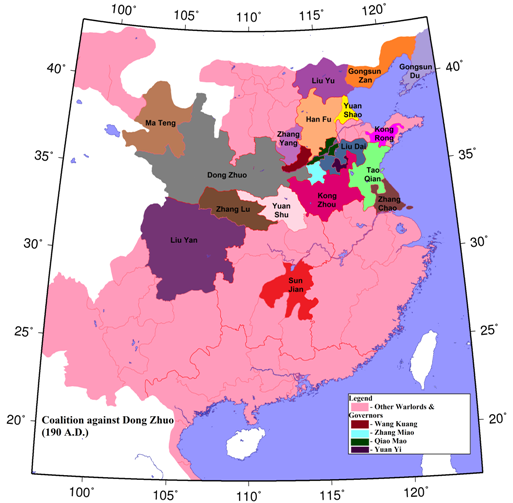 As luck would have it, in the three kingdoms period it flwoed fairly dsimilar to where it does today, but according to Wikipedia and T. R. Tregear's A Geography of China, between 595 BC and 1946 AD it shifted its course "26 times noticeably and nine times severely.". Due to hills and then the estuary (which you can actually see on the map! ), the Yangtze was much less likely to change, although its larger flow (over ten times the yellow river's) meant plenty of flooding. So what's the major change? The Huai river, roughly halfway between the two (it included Kong Zhou's southeast border in the 190 map). 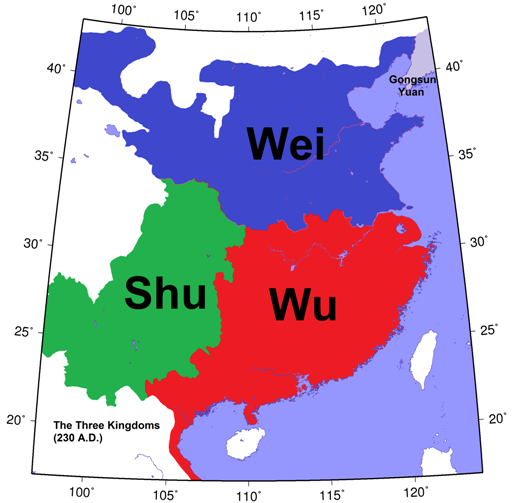 Back in the three kingdoms period, it flowed all the way to the pacific (roughly 190 map's Tao Qian/Zhang Chao/pacific tripoint). But starting in 1194, silt from the yellow river's shifting eventually interfered with it, and these days after it hits Lake Hongze (somewhere around Zhang Chao's near-isolated land in the 190 map), then flows southeast into the Yangtze. Now, I can;'t help 100% with maps, but I do know that https://commons.wikimedia.org/wiki/File ... ic_map.png contains modern geogrpahy, rivers, and coasts (which in general are fairly similar to back then) and has a nice big resolution (2,876x2,094). As a bonus, it turns out they used the same projections, so if you have GIMP (or another art program, although I use GIMP because it's free), it's not too hard to combine the terrain with Fornadan&Jolt's maps (I once roughly copied the Jingzhou commanderies onto a chunk of East_Asia_topographic_map; it's low quality, so I never uploaded it).